We are proud to be celebrating our 12-year anniversary. Since 2006, our focus has always remained the same – provide cost-effective tools built on dependable and flexible technology so that our customers can do one thing – increase profitability. We have helped over 100 newspapers build profitable acquisition and retention programs with our Inka Cloud suite of solutions as the core foundation. Your end result is our goal. Let us do the heavy lifting and provide you the quarter-inch hole – fast, reliable data intelligence and campaign execution. Our approach is simple. Our solution is proven. Our time to market is quick. Our results are positive. Our proven Inka Cloud CRM solution for power users. Power Cloud allows newspapers to host Inka Cloud CRM within their own private cloud eliminating hardware and software costs. Retention reporting and analytics, fully hosted. 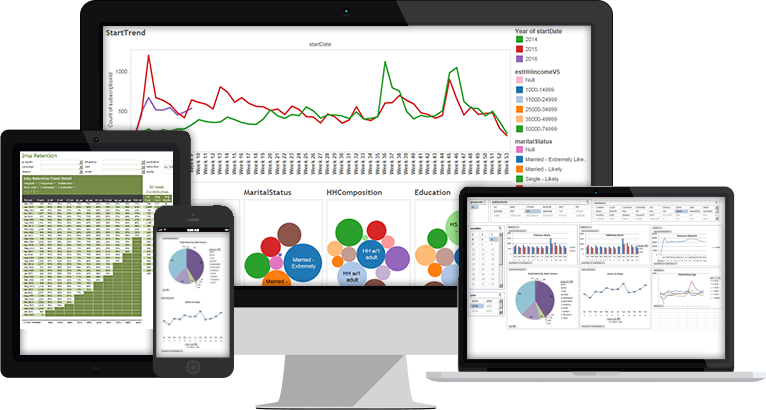 Includes dashboards to easily view starts and stops by sales channel or time period with direct data and report access from any PC, Mac, iPad or Android device. A dedicated Inka expert to help with your acquisition and retention programs. Includes ongoing consulting, curriculum development, and campaign management support. Our partnership with visual analytics software leader, Tableau, provides Inka clients another solid reporting tool to add to the overall data analysis toolbox. With over 20 years of experience in Circulation, Advertising and the Data Science and Technology field, Evan founded Inka to provide newspapers a simple way to get access to data and execute campaigns faster. Evan is a former Gannett and Hearst Corporation newspaper executive. Bill joined Inka Solutions in 2012 after more than 30 years as a newspaper executive with New York Times Regional Media Group. He specializes in Consumer Direct Marketing, Advertising research and analysis and New Business Development. Kristie came to Inka with over 14 years of experience in marketing solutions and sales support. As Director of Database Marketing, she oversees more than 100 automated campaigns for over 40 newspapers on a daily basis, including the development of new campaign processes. Ryan joined the Inka team in 2014 bringing his technical expertise and software platform knowledge to support our growing client base. He assists in all facets of data fulfillment from data collection to processing and reporting, plus overall database management. JoAnn has worked as a marketing executive for over 25 years specializing in strategic development, project management, and Internet marketing. Prior to Inka, JoAnn was a partner at Marketing G2 and a former Director of Marketing Technology for Gannett. Amy spent 15 years working in corporate retail focused on Merchandise Planning and Distribution for major brands; Gap Inc., Gymboree, and The Limited. She currently supports Inka as Business Manager, responsible for Finance and Human Resources Administration. Art has over 30 years of systems and business analysis experience which includes circulation systems maintenance and support as well as responsibility for the design, execution and performance tracking of direct mail, telemarketing and email campaigns. Are you ready to take your acquisition and retention marketing to the next level? Learn more about Inka Solutions and our suite of products. With locations in South Lake Tahoe, CA and Tampa, FL, Inka Solutions is available across North America to serve your business needs. Copyright © 2019 by Inka Solutions. All Rights Reserved.